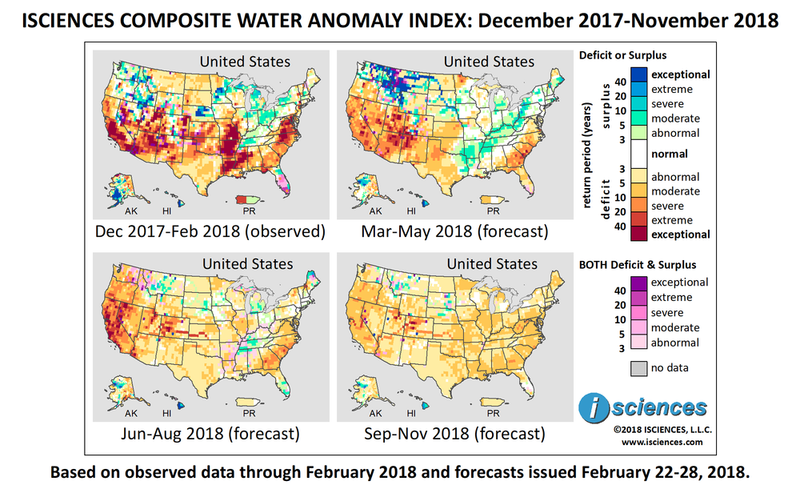 The 12-month forecast indicates widespread water deficits in many parts of the US stretching from Oregon to Maryland. Deficits are expected to reach exceptional severity – a return frequency of 40 years or more – in southern California, western Nevada, northeastern Utah, southwestern Colorado, and southwestern Arizona. Primarily moderate deficits are expected in the Southern Plains States, Mississippi Valley, and Gulf Coast, with more severe conditions in the Texas Panhandle. Moderate to extreme deficits are forecast for the South Atlantic States from Maryland to Georgia. Southern Michigan and the Ohio River Valley will see moderate surplus conditions, though some areas will experience both deficit and surplus (pink/purple) as transitions occur. Moderate surplus is also forecast for the Missouri River into southwestern Montana. Both deficit and surplus conditions are forecast for northwestern Montana, northern Idaho, and eastern Washington. Outside the contiguous US, surpluses are forecast for northwestern Alaska and the northern half of the Alaskan Peninsula, trailing into the interior; deficits are forecast for the eastern half of the state. Intense surpluses are forecast for Hawaii, and moderate deficits are expected in western Puerto Rico. The near-term forecast – March through May – clearly indicates a transition out of deficit in Missouri, Arkansas, Louisiana, and Mississippi, with moderate surplus emerging in Arkansas into surrounding states. In the West overall, the extent of exceptional deficit conditions will shrink, but severe to extreme deficits will continue to emerge in California, Nevada, Utah, Arizona, and New Mexico. Primarily moderate deficits are expected in Oregon, and in Kansas, western Oklahoma, and most of Texas west of the Brazos River, though conditions in the Panhandle may be severe. Deficits in the Mid-Atlantic States will shrink, but moderate to extreme deficits will continue to emerge in South Carolina, Georgia, and into northern Florida. Moderate to severe surpluses will continue to emerge in southern Michigan and the Ohio River Valley, and pockets of the Northeast. Exceptional surplus conditions are expected to emerge on the Missouri River into western Montana and in northern Idaho. Surpluses of varying severity are forecast for Washington State, including along the Columbia River. From June through August deficits will persist in the West, and downgrade in the Southwest and Southern Plains States. The extent of exceptional deficit in California will increase as isolated pockets emerge throughout the state to join persistent severe and extreme deficits. Deficits will intensify in northwestern Nevada, diminish in Utah, and emerge in more areas of western Colorado. Extreme deficits are expected along the Arkansas River in Colorado and Kansas. Moderate deficits will spread throughout Illinois and emerge nearby in Indiana and eastern Missouri. Surpluses will diminish considerably in the Ohio River Valley, as will surpluses along the Missouri River, western Montana, and the Northwest. Deficits in the Carolinas, Georgia, and northern Florida will downgrade slightly; moderate deficits will re-emerge in Virginia and emerge in pockets of the Northeast. The forecast for the final months – September through November – indicates moderate deficits throughout much of the country with more severe deficits along some rivers in the western half of the country. A series of storm systems in late February and early March ravaged the Midwest, south-central states, and New England. Flooding in northern Indiana and southwestern Michigan, as detailed in February "Impacts," damaged over 2,000 homes, prompting state-level disaster declarations for 18 counties in Indiana and 17 in Michigan. Rainfall and melting snow in the Upper Mississippi Valley prompted the U.S. Army Corps of Engineers to relieve pressure on downriver levees in New Orleans by opening the Bonnet Carré Spillway in Louisiana, diverting water into the Gulf of Mexico via Lake Pontchartrain. The river has already overflowed its banks in northern Louisiana. Winter Storm Skylar, the third nor’easter to hit the U.S. in two weeks, grounded 1500 flights across the eastern seaboard this month. An earlier storm also stopped flights, flooded Boston, and left 1.7 million homes and businesses without power. Though rain and snow plague many parts of the nation, the country's winter wheat-growing region is suffering extremely dry conditions. Over 50 percent of Kansas winter wheat was rated “very poor to poor” by the USDA this month as drought conditions persist. According to research recently published in the journal Nature, spring snowpack in the western US has dropped by up to 30 percent in the last 100 years, an amount equivalent to the volume of water in Lake Mead. Warmer temperatures prevent snowpack accumulation which can lead to drought, as it did in the US West after 2015's record low April 1 snow water equivalent (SWE), the amount of water in the snowpack. In another study, a NASA scientist says particulate matter - dust - is also affecting western snowpack by reducing albedo, or reflectivity. The DHS and the FBI jointly issued an alert stating that, since March 2016, Russian government cyber actors have targeted critical US infrastructure sectors, including energy, nuclear, commercial, water, aviation, and manufacturing, using scripts to create local administrator accounts disguised as legitimate backup accounts.